California Governor Pat Brown praises the work of the MTA Board at a civic luncheon in 1961, where, from left, Gov. Brown, U.S. Senator Clair Engle (D-CA) and MTA Chairman A.J. 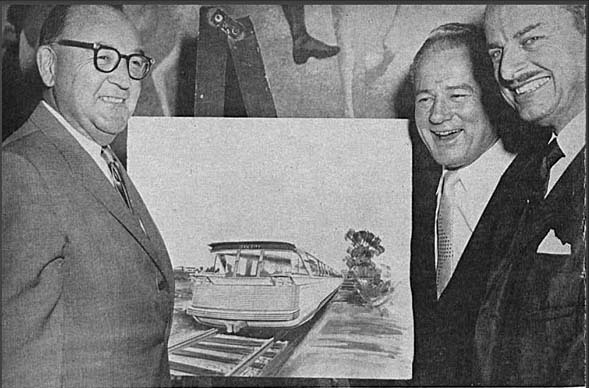 Eyraud proudly show off L.A.'s imminent state-of-the-art rapid transit rail car for the proposed rapid transit system to Century City. Photo originally published in November 1961 edition of The Metropolitan Transit Authority (MTA) employee newsletter Emblem. The title says it all but Metro’s digital resources librarian Kenn Bicknell spells out exactly what happened 50 years ago this week in the library’s Primary Resource blog. That is when Metro’s predecessor agency, the Los Angeles Metropolitan Transit Authority, unveiled its plans for the Backbone Route, the 22.7-mile-long first leg of a rapid transit system that was to run from El Monte in the east to the yet-to-be-built Century City in the west. And here we are in 2011 and the Westside Subway Extension is now being planned to connect downtown L.A. with…Century City. Except for the fallout shelters, a diverse array of transit service can be found today along the actual routes proposed 50 years ago, says Bicknell. Check it out at the Metro Library’s Primary Resources blog. Open forum: what are some good road/commuting bikes? Rapid Transit from El Monte to Century City? Oh I wish!! I have this (horrible?) dream that some day Metrolink will go out of business. Metro will purchase the tracks. Metro will electrify the ROW and run rail from the new El Monte station into Union Station. Basically a silver line that isn’t affected by traffic on the 10 freeway. Actually, the Silver Line will (relatively) soon have two carpool lanes in both directions because of expansion under the ExpressLanes project. If it works, speeds in those lanes shouldn’t drop under 45 mph. Great piece! Can’t wait to see more. Its interesting to compare station placement ideas then and now. It does seem odd that the backbone was to stop at CC and not make it to Westwood/UCLA. I have to say, the train in that illustration is an ugly bugger. I like the idea of electrifying the Metrolink tracks, Not sure if Metro has the money, though. Virgin Trains, Hanshin or Hankyu Railways want to take over? What an embarassing photo. Looks like a bunch of used car salesman. Hmmm, Century City, the model of 1960’s auto-intensive high rise development. Its sure to be a transit success. With more square footage of parking than office space and a nice cloverleaf interchange maybe the Fidelity customers will take the subway. Maybe the parking attendants too. Keep the propoganda going Metro. One more “transit dog” on the way. Guess this comment will be edited out. Metro already owns most of the track in LA County that Metrolink operates on. Metro pays Metrolink to operate commuter rail services in the county. Rapid mass transit via helicopter? That’s awesomely Jetsonian!